Many people visiting Mallorca come with the idea to enjoy and relax on the beach, but also to explore the island. So today we would like to share 5 popular excursions to do from Puerto Pollensa by bus. These ideas are great for sure and don´t doubt visiting these highlights, but Mallorca offers much more. It is an island that does surprise many people, many people fall in love with Mallorca and therefore the island knows many repeating visitors. Puerto Pollensa is a beautiful town in the north of Mallorca. Life is relaxing, the people are friendly, beaches are wide and ideal for families with children, there are plenty of bars and restaurants, there is a nice atmosphere and the village is never too crowded. Puerto Pollensa is varied, but so is the rest of the island! So after a few days recovering of the busy life back home and spending time in resort, it is time to see a little more of Mallorca! The Formentor valley is spectacular and just around the corner from Port de Pollensa! The Formentor Xperience is the perfect way to explore the peninsula as this excursion is a combination of bus and boat. You will be driven through the valley on a cabrio bus, and there will be different stops. The beach of Formentor which is known as one of the most beautiful beaches of Mallorca, is one of the stops as well and the excursion includes a 25 minutes boat trip from the beach back to Puerto Pollensa with stunning views you only get to see from a boat. This combination of bus and boat costs € 26 for adults, € 13 for children and is a great experience, the Formentor Xperience! Discover the hidden corners of Mallorca from Port de Pollensa! Explore the medieval village of Arta and get inspired by the handicraft market and galleries. Local lunch we have in the village of Maria de la Salut, delicatessen of Mallorca and wine will be served. Another worth visit is the traditional Spanish manor house of Els Calderes where you have free time to explore. We finish the day at the local Aloe Vera farm, for an interesting tour and where you have the chance to buy local products. We offer this exclusive excursion for € 34 for adults and € 20 for children. Our famous Island Tour is famous for a reason, this experience and combination of all types of transports is unique! You will be driven through the mountains of the Serra de Tramuntana, at the end of this ride you will be rewarded with free time in Sa Calobra and its breathtaking scenery. From Sa Calobra we take the boat along the coastline to Puerto Soller, where we have time to explore the village. The wooden tram will take us in to the town of Soller for a nice break and then it is finally time for the authentic journey on the original wooden train. Go back in to the time and get surprised by more and more beauty, the Island Tour has it all and you will get to see something different all the time! 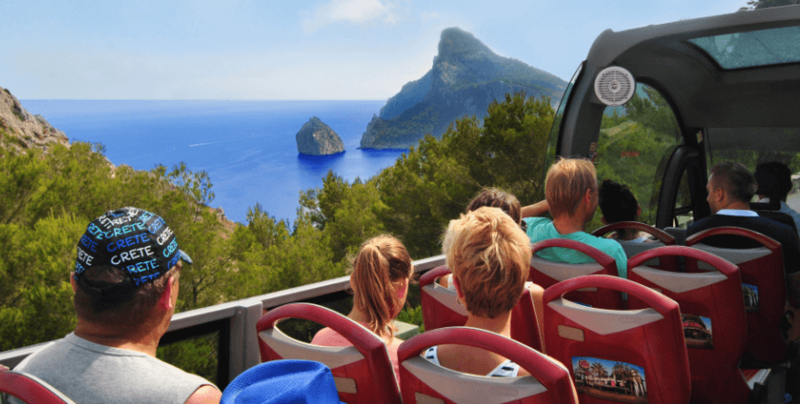 Book this alternating day out from Puerto Pollensa for € 65 for adults and € 17 only for children, with all the transports included! From the village of Puerto Pollensa to the capital of the island, Palma de Mallorca! A sightseeing on the coach along the highlights of the city, a stop at the San Carlos Castle and a drive through the big port of Palma. The Cathedral is the ultimate peak of the city and a worth visit. The entrance of the Cathedral is included on this excursion, as well as the guided walk through the center. Wander around the small streets, you´ll even have time for shopping! All these opportunities you will get on the Palma Premium excursion for only € 33 per adults and € 20 per child. The Caves of Drach are a must-do whilst staying in Mallorca, get to experience the most visited caves of Europe and don´t miss the great opportunity to take a short boat trip on the largest underground lake in the world. This excursion also includes a visit to the local market in Sineu, a picturesque village located in the heart of Mallorca. As well as a stop at the famous Pearl Factory in Manacor and free time for a swim in the Mediterranean Sea and lunch in Puerto Cristo. This combination of visits makes it an ideal and fun day out for families ánd is the reason why it is a popular experience; join us for € 42 per adult and € 21 per child. Also, from 2018 there is a half day option available. Where to book these excursions?